Mrs May's deal has been rejected on three separate occasions so far. The Commons has been attempting to find a strategy that can gain majority support. Detractors say such an option in effect means not really leaving at all, as the UK would be subject to EU rules and regulations it had no say over. A customs union would also limit the UK's ability to strike its own trade deals with non-EU countries. Mrs May is said to be considering bringing her withdrawal agreement for a fourth vote, as the result of the third was closer than the previous two. But MPs still rejected it by 344 to 286, a majority of 58. Whether there will be another attempt to find a majority for one of the options - a move supported by Leader of the Opposition Jeremy Corbyn - to then allow a "run-off" vote between that option and Mrs May's deal is unclear. If nothing is passed by the Commons, Britain is due to leave the EU without a deal on 12 April. Many MPs and business leaders fear a no-deal or "hard" Brexit could cause chaos, at least in the short term. Although a no-deal exit has been regarded as unlikely, given the opposition of most MPs, by what method this can be avoided - and even who will be in charge of the process - is uncertain. Many in the EU now regard a "no deal" Brexit on 12 April as the most likely outcome. If MPs pass Mrs May's deal, Britain would have until 22 May to leave - after the EU granted an extension to the original exit date of 29 March. Any later than that - for, say, a general election to create a new House of Commons that would possibly be able to break the deadlock - would require the EU to agree on a lengthy extension of the period before Britain is due to leave the bloc. The EU says a further extension is only possible if the UK takes part in elections to the European Parliament on 23 May. Mrs May has previously said she does not wish the UK to take part in those elections. The European Council - the main decision-making body of the EU, made up of the leaders of member states - is due to meet on 10 April, to decide - if necessary - whether the conditions for a longer delay have been met. There is a third option: the UK could revoke the so-called Article 50 and cancel Brexit altogether - but this appears very unlikely. 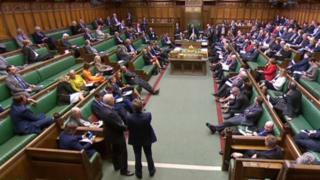 Monday's votes were the second round of a process that got under way last week after Mrs May's government was defeated in a vote that allowed MPs to seize control of business in the chamber from the government for two days. Last Wednesday, eight Brexit alternatives were all rejected, but Monday's second round was scheduled amid suggestions there could be majority support for at least one of them. Four of the eight new options proposed on Monday were selected by Commons Speaker John Bercow. The third defeat of Mrs May's agreement came last Friday. Are we anywhere near the end of all this? As with much else in this saga, that remains unclear. Whether Mrs May will still be PM over the next few weeks is also up in the air. She pledged to stand down if her deal passed, but many now question whether she has the authority to stay if it doesn't. It is worth remembering that the debate now is focused on the terms of the UK's exit from the EU. The conditions of the future relationship between the country and the bloc, assuming the UK leaves at all, still have to be negotiated. Massive uncertainty for people and businesses in Britain and the wider EU remains.